1. The gift of Truth and Justice and the knowledge that the American Justice system works as I won a copyright infringement trial against Marsha Petrie Sue who not only copied my materials word for word but who also had the audacity to call her 2007 book Toxic People, the same name as my 1995 book Toxic People. It was the best gift in the world to see that people like her cannot get away with this and that they must be held accountable for their actions and that everyone must know it. 2. 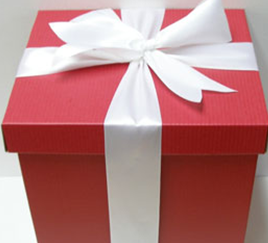 The next gift was the enormous outpouring of the public response, support and touching comments of how I inspired so many people by going the distance and fighting for my rights against people like Marsha Petrie Sue who take what you created and claim it as their own and how it inspired them to fight for their rights as well. The gift of their beautiful words are forever in my heart . 3. The powerful and healing words Eric Bjorgum, my wonderful intellectual property attorney so eloquently spoke in the US Federal courtroom is another gift I will carry with me forever. 4. The gift of seeing how many people have already been impacted by reading my TOXIC MEN book is also a huge gift to me. The moving feedback of so many readers along with the support of Patti Stanger, BRAVO’s Millionaire Matchmaker, Dr. Laura, Dr. Robi Ludwig, and Robin Sax, and of course SNOOKI have meant so much to me. 5.The gift of working with Nancy Grace and being a regular contributor to her HLN show as well as to her Swift Justice Show. Being around Nancy Grace, a woman with a mission who’s dedication to justice and to helping crime victims continues to inspire me. 6. The gift of working with Adams Media and F and S Publications and in particular the wonderful people who have been so supportive of me and my books and allowing me the forum to express myself so that I can get my message across to others. 7.The gift of being able to regularly express my thoughts and share my knowledge throughout the media from having my own body language column in Cosmopolitan Magazine to appearing as a resident body language expert on such shows as Millionaire Matchmaker and Dr. Phil as well as other television, radio , magazine, and internet outlets on a regular basis. I count my blessing daily. 8. The gift of giving back is one of the things for which I am most grateful. Every week my family members and I travel around town to find those in need and provide them with a few things which can make their lives a little easier on the streets , from fresh warm blankets, to warm socks, and tee shirts and sweats . Seeing bright eyes and smiles on faces that haven’t smiled for a long time, makes life worth living and is the best gift I can ever receive. 9. The gift of new friends who seem like old friends ( ie. Michael, Cat, Deborah, Ree, Lois, Art, Jim, Steve,) and my old friends who have been renewed ( ie. Jan and Dave, Reba, Martha, Elis, Chopsey, David, Bob and Stacy, Susan, Shar , Ilsa, Robert, Teri, Nancy, Donna , Jennifer, Gloria, Rolanda, Carrie, Mark, Bob, Phyllis, Suzy Connie, Chris, Donna, Katiem Kerry, Janet Victor David W, Motty, Shadoe, Brian, John, Gail) and to FB for now allowing me to keep in touch. I am grateful for all of my FB friends and friends on Twitter and most of all my very close and special friends who add to the beauty of my life. 10.And last but not least I am grateful for the gifts that my beautiful family has given me throughout my life and continues to give me- their integrity, honesty, sincerity, continued love and support which I truly cherish. Nice! Thankyou for going to bat for all the other artists in the world! Greg Kempf American Artist. Greg your words touch my heart and inspire me. One’s creativity like your beautiful art is a gift from God and let no man or woman take what God has inspired you to do and bless you to do and claim it as their own. A huge hug.